The History of St. Mary Orthodox Church in Falls Church, VA. The founders of Protection of the Holy Mother of God Orthodox Church (“St. Mary Orthodox Church” for short) celebrated our first Divine Liturgy in February 1987. The parish was founded by six Romanian-American families and three converts to Orthodoxy under the tireless leadership of Armand A. Scala. Families attending the first worship service were Scala-Ficken, Georgescu, Harrington, Phile, Robertson, Scala, Sorovacu and Zimmerli. They recognized a great need for an English-language parish in Fairfax County in northern Virginia. Their first church “home " was Dunn Loring United Methodist Church, where they celebrated the Divine Liturgy every Sunday for approximately 2 ½ years. 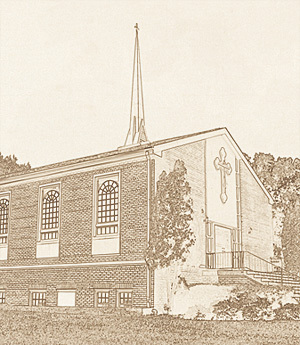 In July 1988 the community was granted "parish" status by our Episcopate, and Fr. Alexander F. C. Webster, Ph.D., was appointed the first permanent parish priest by then Bishop Nathaniel. Today the congregation includes approximately 200 adult members and some 50 Sunday school students. The Lord has always guided the progress of our small community. We have been blessed with uninterrupted services and access s to facilities since our first Liturgy. For six years, until the summer of 1996, our services were held in a former parochial school library at St Phillip's Roman Catholic Church. February 1996, however, began an extraordinary pilgrimage for the parishioners of St. Mary. On Sunday, February 4, 1996, the parish was notified that our host church needed more room for its expanding day care program, and that, consequently, our lease would not be renewed. Within an hour of that stunning news Fr. Alexander was informed that a neighboring church, hardly three miles away, seemed to be for sale. The following Sunday, a parish meeting was held there and the faithful decided to purchase the church. Within a week our small parish miraculously pledged enough to purchase both the church and the accompanying parish parsonage. During the following weeks, our energetic membership worked tirelessly, painting, cleaning, and repairing the church. On August 4, five weeks after we reached a settlement on the property and precisely six months from the day we learned about our termination at St Phillip's School, we celebrated our first Divine Liturgy in our new spiritual home. Divine providence had turned a crisis into a wonderful opportunity and our very own house of worship. On October 8-9, 2000, His Eminence, Archbishop Nathaniel consecrated the Holy Table and the entire church building, assisted by some two dozen neighboring and visiting Orthodox priests and deacons. It was a truly joyous and inspirational event for the hundreds of parishioners, friends, and ecumenical guests who attended those rites. As an Orthodox parish in Fairfax County dedicated to the use of English in our Liturgies, we have adopted evangelism and service as our special missions to northern Virginia. We exist as an Orthodox community to witness on behalf of the life in Christ and to serve the spiritual and material needs of the local community. We were also blessed in 2001 when Archbishop Nathaniel appointed Protodeacon Peter Danilchick to serve as parish deacon, one of whose primary ministries is the coordination of our charitable outreach programs, including several with global reach. In 2005, Fr. Alexander, who had been serving in the Army National Guard as a chaplain for many years, was promoted to the rank of Colonel. Shortly thereafter, he announced his acceptance to serve the military on a full time basis as active duty with the U.S. Army. He completed his pastorate at St. Mary in June of 2005, going on to serve in Iraq, Afghanistan, and other locations in the Middle East. He remained locally assigned, including Ft. McNair in Washington D.C. During the last six months of 2005 the parish was served by substitute priests, especially including Rev. Fr. Joseph Woodill who carried the parish with stability and love during its time of transition. After an interim period, we were blessed with the appointment of our current rector, Rev. Fr. David G. Subu. On January 1st, 2006, Rev. Fr. David G. Subu began his assignment at St. Mary, with his Preoteasa, Stephanie, and their three children. Partnering with our dynamic parish laity, Fr. David initiated a number of new ministries including Church School retreats, support of campus ministries and OCF Real Break, summer mission trips to Project Mexico and Romania, Young Adult ministry, Mothers of Orthodox Pre-Schoolers, a Peer Depression Ministry, expansion of our choir and chanting programs and liturgical offerings, and greater involvement with our deanery and Episcopate. At the same time, the long planned Iconography Project began to bear visible fruit as the first phase of large festal icons began to be installed in the sanctuary, revealing new heights of beauty to the parish. The Project was completed in 2010, transforming the church and the experience of worshiping therein. Our next step is determining how best to develop our facilities to meet our growing needs, including expanding our parking lot and fellowship hall.